This past weekend, we kicked off a new series at Concordia titled, “Credo! Trusting in the Truth.” In this series, we are examining some of the foundational doctrines of biblical Christianity using the contours of the Apostles’ Creed. Because we are using to the Apostles’ Creed to guide us through our doctrinal foray, I thought it might be helpful to offer a little bit of background on the origin and formulation of this creed. The Apostles’ Creed finds its birth between AD 100 and 120 when it was used as a baptismal liturgy to guide new converts in the true faith. A legend from the fifth or sixth century conjectures that the Creed was written by the twelve apostles themselves, each contributing a line to it. According to the legend, Peter opened the Creed: “I believe in God, the Father Almighty,” with Andrew then adding, “And in Jesus Christ, His only Son, our Lord,” while James the elder continued, “Who was conceived by the Holy Spirit.” Although this legend may seem pious, it is also certainly apocryphal. In both of these statements from Ignatius and Hippolytus, we find creedal language. Thus, the great doctrines of Christianity as confessed in the creeds are as old as Christianity itself. Whenever I speak on or write about the creeds, an inevitable objection, often stated as a question, arises: “But why do we need the creeds? We already have the Bible! Shouldn’t we have no other creed than the Bible?” The Bible, as God’s inspired, inerrant, infallible Word most definitely gets the first – and for that matter, the last – word. The creeds, however, are nevertheless invaluable to the Church and ought to be retained by the Church for three reasons. The Bible itself contains creeds. The idea for Christian creeds comes directly from the Bible itself! Creeds contained in the Bible include, “Jesus is Lord” (1 Corinthians 12:3), “Christ died for our sins according to the Scriptures, He was buried, and He was raised on the third day according to the Scriptures” (1 Corinthians 15:2-3), and, of course, the beautiful and poetic confession of Christ as God in Philippians 2:5-11. And these are just a few examples of creeds contained in the Scriptures. Christians have always wanted to be able to confess their faith and creeds afford opportunities to do this. So it is only natural that Christians would have creeds. Even in the fourth century, not every Christian was as familiar with his faith as he should have been. Thus, Cyril employs the Apostles’ Creed as a tool to teach the cardinal canons of the Christian faith. The creeds can do the same for us. The creeds guard against error. The Apostles’ Creed was, in ancient parlance, referred to as “the rule of faith.” That is, it served as a guideline by which to distinguish orthodoxy from heresy. Indeed, part of the problem with those who say, “I have no other creed than the Bible” is that many sects pervert the Scriptures to suit their own twisted teachings, even as the apostle Peter warns: “Ignorant and unstable people distort…the Scriptures to their own destruction” (2 Peter 3:16). For example, the Jehovah’s Witnesses claim only to use the Bible to arrive at their doctrines, yet they deny the doctrine of the Trinity. The creeds, especially the Nicene and Athanasian Creeds, will let you do no such thing. I had a professor in seminary who would tell his classes, “You need the creeds because they keep you from getting weird.” This precisely right. 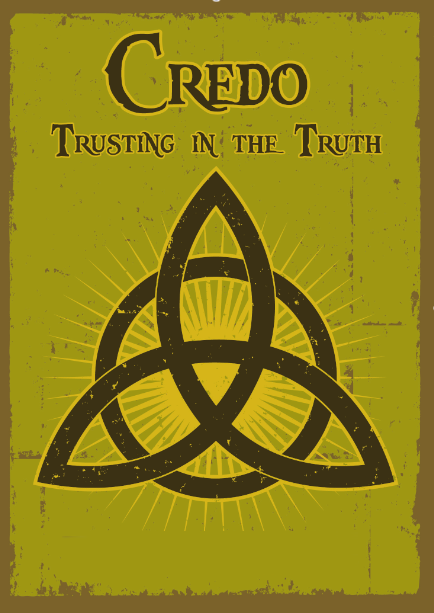 The creeds guide us along the course of true faith. It is with this in mind that we hope you’ll join us these next several weeks at Concordia as we revisit the basics of Christian doctrine to which we can joyfully proclaim, “Credo!” – I believe! Entry filed under: ABC Extra. Tags: Apostles' Creed, Creed, Cyril, Hippolytus, Ignatius, Rule of Faith.